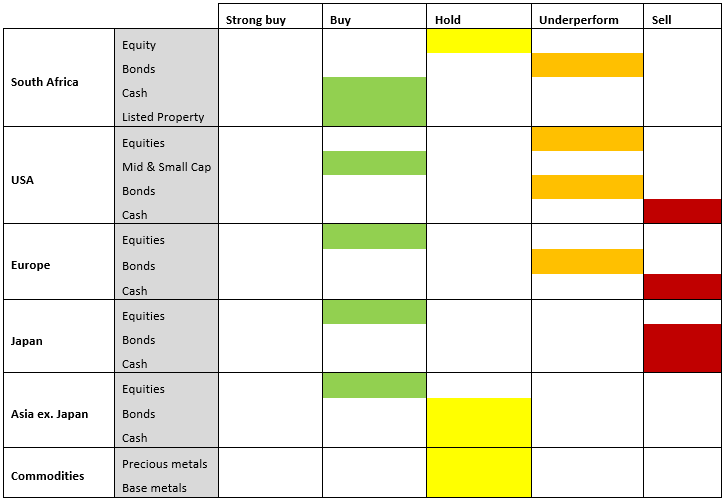 This table reflects our view of the relevant assets, based on expected performance. 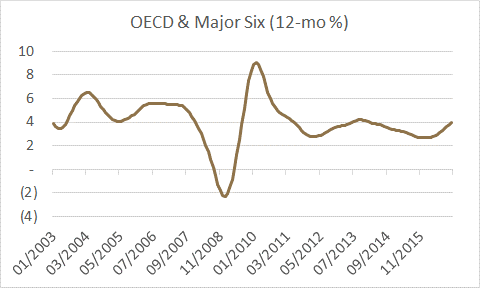 Global growth is improving, the graph below plots the OECD Leading Indicator percentage change year on year (YoY) for members and the major six non-members which is a good proxy for global growth. The importance here is the change in trend. To confirm the change in growth trend we monitor global trade. The logic is increased trade will require increased production. 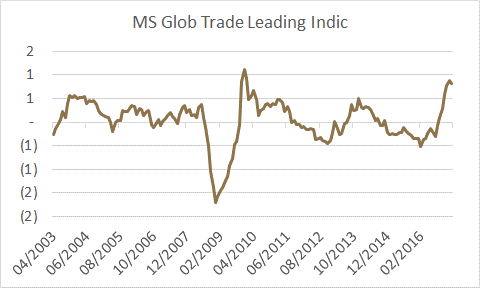 Morgan Stanley developed a Global Trade Leading Indicator and the index has turned positive aggressively. Lastly, market consensus has stopped down-grading GDP expectations for 2017 and 2018. 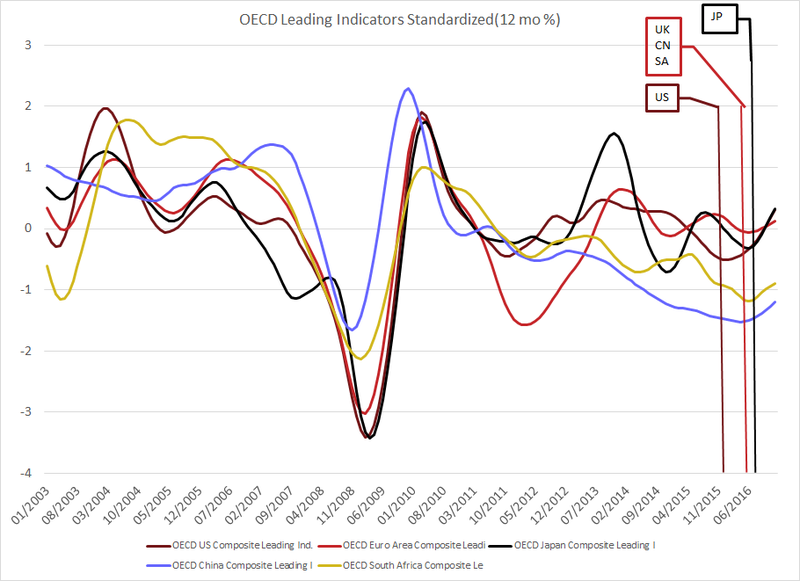 The graph below plots standardized OECD Leading Indicators YoY for specific regions. It is noticeable that the US cycle turned at the end of 2015, Europe turned mid 2016 along with China and South Africa. Japan turned in the 3rd quarter of 2017. The strength and quality of the growth momentum is still debatable in some regions but it seems that green shoots are developing. Inflation has been one of the indicators aggressively targeted by monetary authorities since the great recession of 2008. Massive stimulus has been pumped into the global economy to stimulate growth and re-ignite inflation. The graph below plots the historical series for market consensus inflation expectation for 2017. US and European inflation expectations are increasing with tentative signs evolving in Japan. 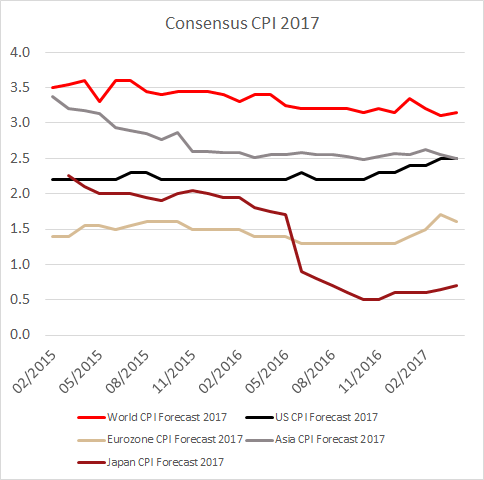 A moderate and controlled inflation rate is a sign of a healthy economy as is the case in the US, which is also evolving in Europe and Emerging markets. North Korean risk is being elevated as the US is trying to get China to apply more pressure on their ally. Middle Eastern conflict combined with ISIS attacks in Europe and across the world remains a persistent problem. Russian aggression in the Baltic and involvement in Syria is also on top of the list. The major risk in this category is the US fiscal policy error as Trump tries to roll out his policies. He has had a rocky start up until now and we can expect further troubles here. Monetary policy error is a big risk as the US, Europe and Japan is in a very sensitive stage of the cycle. The US started hiking rates and Europe and Japan are still applying quantitative easing (QE) but will start to tape at some stage. We expect Europe to do some form of tapering QE towards the end of the year. Leveraged positions can cause accelerated sell-offs. Leverage can be found across the investment universe. The search for yield drives investors into carry trades that can have substantial leverage. Open interest positions in US 10-year Treasury note futures trading on Chicago Board of Trade is at an all-time high. When considering market valuations, we analyse price-based valuations relative to longer term averages and on a relative basis. We secondly analyse profitability, operating margin and return on equity (ROE). We prefer indices with below average profit margins and ROE, which will allow for expansion. Both emerging markets valuations and profitability are relatively more attractive than developed markets, apart from MSCI Asia ex Japan’s operating margin which is marginally above the long-term average. Europe is also reasonably attractive. MSCI Japan’s valuations are very attractive but profitability is moderately above the long-term average. Both the S&P 500 index and the Russel 2000 index valuations are expensive and profitability is moderately above the long-term average. We calculated the expected one year index total return for the regions purely on valuation, by assuming the index PE rating will mean-revert and using consensus earnings and dividend expectations. We prefer emerging market equities; the macro drivers are improving and valuations are reasonable. We have moved from neutral to overweight Europe and Japan as growth improves in conjunction with persistent stimulus. The regions will also act as a hedge to a strong dollar as both have an export bias. We added exposure to US mid and small cap equities as a hedge to Trump’s policy risk that could jeopardise emerging markets. Our commodity position remains neutral as this will add leverage to the emerging market equity exposure. 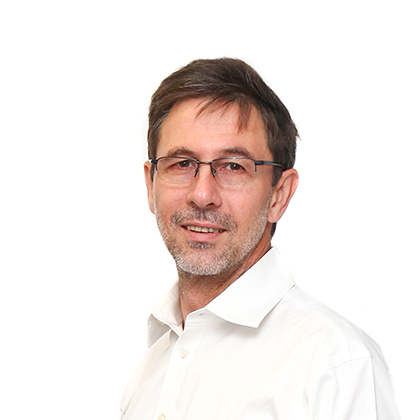 We remain underweight in developed market – and South African bonds and retain the overweight domestic property and cash position. 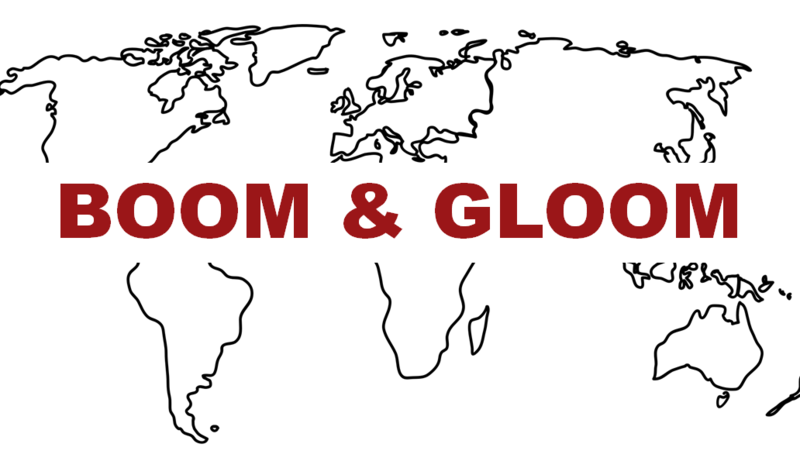 Please email us if you’d like to have Boom & Gloom delivered to your inbox every month. The information in this document is proprietary to Ora Fund Managers (Pty) Ltd (Ora) and is not to be reproduced, distributed, published or used for any purpose other than the evaluation of any proposal contained in the document, except with the written permission of a representative of Ora. The information contained in this document (together with any opinions expressed or further information provided in connection with this document) is of a general nature and provided for illustrative purposes. It does not address the circumstances of any particular person or entity and it is not a recommendation or advice in relation to any transaction or investment. In making this information available, we are not purporting to act in any way as an advisor or in a fiduciary capacity. No one should rely on any of this information without appropriate advice from an independent financial adviser, based on a thorough investigation of the investor’s specific circumstances. While we have taken care to ensure that the information is accurate and not misleading, Ora makes no representations or warranties of any kind with respect to its accuracy, completeness or correctness. The information is provided on the clear understanding that Ora will not be held liable or responsible for any loss or damages that may be suffered by any person or entity as a result of that party placing reliance on or failing to act on any of the information provided. This document is proprietary to Ora Fund Managers (Pty) Ltd (Ora). It is for information only and may not be distributed or used for any other purpose. It does not address the circumstances of any particular person or entity and is not a recommendation or advice in relation to any transaction or investment. This document should not be relied on without proper advice from an independent financial adviser. We have taken care to ensure that the information is accurate and not misleading but do not guarantee its accuracy or correctness or that it will not change. Ora will not be held liable for loss, damages or expenses by any person or entity as a result of that party relying on or failing to act on any of the information provided. The investment value of any financial product mentioned in this document is not guaranteed. Ora Fund Managers (Pty) Ltd is a licensed financial service provider.